The room in Báb's house in Shiraz where he declared his mission on the evening of May 22, 1844. Bábism or Bábíism (Persian: بابیه‎‎, Babiyye), also known as the Bábi, Bâbi, or Bábí faith, was a new religious movement that flourished in Persia from 1844 to 1852, then lingered on in exile in the Ottoman Empire, especially Cyprus, as well as underground. Its founder was ʿAli Muhammad Shirazi, who took the title Báb (lit. "Gate") out of the belief that he was the gate to the Twelfth Imam. The Bábí movement signaled a break with Islam and started a new religious system. While the Bábí movement was violently opposed and crushed by the clerical and government establishments in the country in the mid-1850s, the Bábí movement led to the founding of the Bahá'í Faith which sees the religion brought by the Báb as a predecessor to their own religion. "The relative success of Bahaism inside Iran (where it constitutes the largest religious minority) and in numerous other countries, where it claims the status of an independent religion, gives renewed significance to its Babi origins", as Bahaism continued many aspects of the earlier sect. Twelver Shi'i Muslims regard the Twelfth Imam, Muhammad al-Mahdi, as the last of the Imams. They contend that Muhammad al-Mahdi went into the Occultation in 874 CE, at which time communication between the Imam and the Muslim community could only be performed through mediators called Bābs "gates" or Nā'ibs "representatives". In 940, the fourth nā'ib claimed that Imam Muhammad al-Mahdi had gone into an indefinite "Grand Occultation", and that he would cease to communicate with the people. According to Twelver belief, the Hidden Imam is alive in the world, but in concealment from his enemies, and that he would only emerge shortly before the Last Judgment. At that time, acting as al-Qā'im ("He who will arise"), a messianic figure also known as the Mahdi ("He who is rightly guided"), the Hidden Imam would start a holy war against evil, would defeat the unbelievers, and would start a reign of justice. In 1830s Qajar Persia, Sayyid Kazim Rashti was the leader of the Shaykhis, a sect of Twelvers. The Shaykhis were a group expecting the imminent appearance of al-Qāʾim. 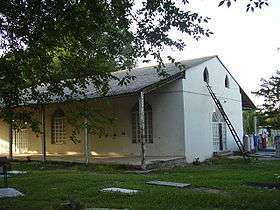 At the time of Kazim's death in 1843, he had counselled his followers to leave their homes to seek the Lord of the Age whose advent would soon break on the world. On 22 May, 1844 Mullá Husayn of Boshruyeh in Khorasan, a prominent disciple of Sayyid Kāẓim, entered Shiraz following the instruction by his master to search for al-Qā'im. Soon after he arrived in Shiraz, Mullá Husayn came into contact with the Báb. On the night of May 22, 1844, Mulla Husayn was invited by the Báb to his home; on that night Mullá Husayn told him that he was searching for the possible successor to Sayyid Kāẓim, al-Qā'im, and the Báb told Mullá Husayn privately that he was Sayyid Kāẓim's successor and the bearer of divine knowledge. Through the night of the 22nd to dawn of the 23rd, Mulla Husayn became the first to accept the Báb's claims as the gateway to Truth and the initiator of a new prophetic cycle; the Báb had replied in a satisfactory way to all of Mullá Husayn's questions and had written in his presence, with extreme rapidity, a long commentary on the surah of Yusuf, which has come to be known as the Qayyūmu l-Asmā' and is considered the Báb's first revealed work. This night and the following day are observed in the Bahá'í Faith as a holy day since then. After Mulla Husayn accepted the Báb's claim, the Báb ordered him to wait until 17 others had independently recognized the station of the Báb before they could begin teaching others about the new revelation. After his declaration, he soon assumed the title of the Báb. Within a few years the movement spread all over Iran, causing controversy. His claim was at first understood by some of the public at the time to be merely a reference to the Gate of the Hidden Imám of Muhammad, but this understanding he publicly disclaimed. He later proclaimed himself, in the presence of the heir to the Throne of Persia and other notables, to be al-Qā'im. In the Báb's writings, the Báb appears to identify himself as the gate (báb) to Muhammad al-Mahdi and later he begins to explicitly proclaim his station as equivalent to that of the Hidden Imam and a new messenger from God. Saiedi states the exalted identity the Báb was claiming was unmistakable, but due to the reception of the people, his writings appear to convey the impression that he is only the gate to the Hidden Twelfth Imam. To his circle of early believers, the Báb was equivocal about his exact status, gradually confiding in them that he was not merely a gate to the Hidden Imam, but the Manifestation of the Hidden Imam and al-Qā'im himself. During his early meetings with Mullá Husayn, the Báb described himself as the Master and the Promised One; he did not consider himself just Sayyid Kāẓim Rashti's successor, but claimed a prophetic status, with a sense of deputyship delegated to him not just from the Hidden Imam, but from Divine authority; His early texts, such as the Commentary on the Sura of Yusuf, used Qur'anic language that implied divine authority and identified himself effectively with the Imam. When Mullā ʿAlī Basṭāmī, the second Letter of the Living, was put on trial in Baghdad for preaching about the Báb, the clerics studied the Commentary on the Sura of Yusuf, recognized in it a claim to divine revelation, and quoted from it extensively to prove that the author had made a messianic claim. The Báb's message was disseminated by the Letters of the Living through Iran and southern Iraq. One of these initial activities were communicated to the West starting January 8, 1845 as an exchange of diplomatic reports concerning the fate of Mullá ʿAli-e Bastāmi, the second Letter. These were exchanges between Sir Henry Rawlinson, 1st Baronet who wrote first to Stratford Canning, 1st Viscount Stratford de Redcliffe. Followups continued until in 1846 he was sentenced by the Ottomans to serve in the naval ship yards at hard labor—the Ottoman ruler refusing to banish him as it would be "difficult to control his activities and prevent him spreading his false ideas." Quddús and other early followers then were sent on to Shiraz to begin public presentations of the new religion. Indeed various activities the Báb initiated were devolved to various Letters of the Living like preaching activities and answering questions from the community. In particular as these first public activities multiplied opposition by the Islamic clergy arose and prompted the Governor of Shiraz to order the Báb's arrest. The Báb, upon hearing of the arrest order, left Bushehr for Shiraz in June 1845 and presented himself to the authorities. This series of events become the first public account of the new religion in the West when they were published Nov 1, 1845 in the The Times. The story was also carried from Nov 15 by the Literary Gazette which was subsequently echoed widely. The Báb was placed under house arrest at the home of his uncle, and was restricted in his personal activities, until a cholera epidemic broke out in the city in September 1846. The Báb was released and departed for Isfahan. There, many came to see him at the house of the imám jum'ih, head of the local clergy, who became sympathetic. After an informal gathering where the Báb debated the local clergy and displayed his speed in producing instantaneous verses, his popularity soared. After the death of the Governor of Isfahan, Manouchehr Khan Gorji, an Iranian Georgian, who had become his supporter, pressure from the clergy of the province led to the Shah, Mohammad Shah Qajar, ordering the Báb to Tehran in January, 1847. After spending several months in a camp outside Tehran, and before the Báb could meet the Shah, the Prime Minister sent the Báb to Tabriz in the northwestern corner of the country, and later Maku and Chehriq, where he was confined. During his confinement, he was said to have impressed his jailers with his patience and dignity. Communication between the Báb and his followers was not completely severed but was quite difficult, and more responsibilities were devolved to the Letters as he was not able to elucidate his teachings to the public. With Bábí teachings now mostly spread by his followers, they faced increasing persecution themselves. The role played by Táhirih in Karbalāʾ was particularly significant. She began an effort of innovation in religion based on her station as a Letter of the Living and the incarnation of Fatimah. In his early teachings, the Báb emphasized observing Sharia and extraordinary acts of piety. However, his claim of being the Bāb, i.e. the authority direct from God, was in conflict with this more conservative position of supporting Sharia. Táhirih innovated an advance in understanding of the priority of the Báb's station above that of Islamic Sharia by wedding the concept of the Bāb’s overriding religious authority with ideas originating in Shaykhism pointing to an age after outward conformity. She seems to have made this connection circa 1262/1846 even before the Bāb himself. The matter was taken up by the community at large at the Conference of Badasht. This conference was one of the most important events of the Bábí movement when in 1848 its split from Islam and Islamic law was made clear. Three key individuals who attended the conference were Bahá'u'lláh, Quddús, and Táhirih. Táhirih, during the conference, was able to persuade many of the others about the Bábí split with Islam based on the station of the Báb and an age after outward conformity. She appeared at least once during the conference in public without a veil, heresy within the Islamic world of that day, signalling the split. During this same month the Báb was brought to trial in Tabriz and made his claim to be the Mahdi public to the Crown Prince and the Shi'a clergy. Several sources agree that by 1848 or 1850 there were 100,000 converts to Babism. In the fall of 1850 newspaper coverage fell behind quickly unfolding events. Though the Báb was named for the first time he had in fact already been executed. By 1848 the increased fervour of the Bábís and the clerical opposition had led to a number of confrontations between the Bábís and their government and clerical establishment. After the death of Mohammad Shah Qajar, the shah of Iran, a series of armed struggles and uprisings broke out in the country, including at Tabarsi. These confrontations all resulted in Bábí massacres; Bahá'í authors give an estimate of 20,000 Bábís killed from 1844 to present, with most of the deaths occurring during the first 20 years. Former Professor of Islamic Studies Denis MacEoin studied documented deaths, both for individuals and for round figures, from Bábí, Bahá'í, European, and Iranian sources, and confirmed at most two to three thousand. He stated that he could not find evidence for any higher figures. Supporters of the Bábís paint their struggle as basically defensive in nature; Shi'i writers on the other hand point to this period as proof of the subversive nature of Bábísm. MacEoin has pointed out that the Bábís did arm themselves, upon the Báb's instructions, and originally intended an uprising, but that their eventual clashes with state forces were defensive, and not considered an offensive jihad. In mid-1850 a new prime-minister, Amir Kabir, was convinced that the Bábí movement was a threat and ordered the execution of the Báb which was followed by the killings of many Bábís. Of the conflicts between the Bábís and the establishment, the first and best known took place in Māzandarān at the remote shrine of Shaykh Tabarsi, about 22 kilometres southeast of Bārfarush (modern Babol). From October 1848 until May 1849, around 300 Bábís (later rising to 600), led by Quddús and Mullá Husayn, defended themselves against the attacks of local villagers and members of the Shah's army under the command of Prince Mahdi Qoli Mirza. They were, after being weakened through attrition and starvation, subdued through false promises of safety, and put to death or sold into slavery. The revolt at the fortress of ʿAli Mardan Khan in Zanjan in northwest Iran was by far the most violent of all the conflicts. It was headed by Mullā Muhammad ‘Ali Zanjani, called Hujjat, and also lasted seven or eight months (May 1850–January 1851). The Bábí community in the city had swelled to around 3000 after the conversion of one of the town's religious leaders to the Bábí movement. The conflict was preceded by years of growing tension between the leading Islamic clergy and the new rising Bábí leadership. The city governor ordered that the city be divided into two sectors, with hostilities starting soon thereafter. The Bábís faced resistance against a large number of regular troops, and led to the death of several thousand Bábís. After Hujjat was killed, and the Bábí numbers being greatly reduced, the Bábís surrendered in January 1851 and were massacred by the army. Meanwhile a serious but less protracted struggle was waged against the government at Neyriz in Fars by Yahya Vahid Darabi of Nayriz. Vahid had converted around 1500 people in the community, and had thus caused tensions with the authorities which led to an armed struggle in a nearby fort. The Bábís resisted attacks by the town's governor as well as further reinforcements. After being given a truce offer on 17 June 1850, Vahid told his followers to give up their positions, which led to Vahid and the Bábís being killed; the Bábí section of the town was also plundered, and the property of the remaining Bábís seized. Later, in March 1853 the governor of the city was killed by the Bábís. These further events led to a second armed conflict near the city where the Bábís once again resisted troop attacks until November 1853, when a massacre of Bábís happened, with their women being enslaved. The revolts in Zanjan and Nayriz were in progress when in 1850 the Báb, with one of his disciples, was brought from his prison at Chehriq to Tabriz and publicly shot in front of the citadel. The body, after being exposed for some days, was recovered by the Bábís and conveyed to a shrine near Tehran, whence it was ultimately removed to Haifa, where it is now enshrined. Bábism, though at present a proscribed religion in Persia, is far from being extinct, or even declining, and the Báb may yet contest with Mahomed(sic) the privilege of being regarded as the real prophet of the faithful. Bábism in its infancy was the cause of a greater sensation than that even which was produced by the teaching of Jesus, if we may judge from the account of Josephus of the first days of Christianity. Latter commentators also noted these kinds of views: Ernest Renan, Stephen Greenleaf Bulfinch, son of Charles Bulfinch, and others. For the next two years comparatively little was heard of the Bábís. 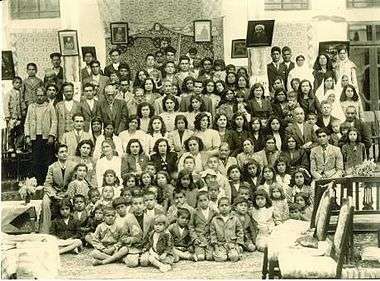 The Bábís became polarized with one group speaking of violent retribution against Naser al-Din Shah Qajar, while the other, under the leadership of Baha’u’llah, looked to rebuild relationships with the government and advance the Babí cause by persuasion and the example of virtuous living. The militant group of Babis was between thirty and seventy persons, only a small number of the total Babi population of perhaps 100,000. Their meetings appear to have come under the control of a "Husayn Jan", an emotive and magnetic figure who obtained a high degree of personal devotion to himself from the group. Meanwhile Tahirih and Baha'u'llah, visible leaders of the community previously, were removed from the scene - Tahirih by arrest and in the case of Baha'u'llah an invitation to go on pilgrimage to Karbila. On August 15, 1852, three from this small splinter group, acting on their own initiative, attempted to assassinate Naser al-Din Shah Qajar as he was returning from the chase to his palace at Niavarān. Notwithstanding the assassins' claim that they were working alone, the entire Bábí community was blamed, and a slaughter of several thousand Bábís followed, starting on the 31 August 1852 with some thirty Bábís, including Táhirih. Dr Jakob Eduard Polak, then the Shah's physician, was an eye-witness to her execution. Bahá'u'lláh surrendered himself and he along with a few others were imprisoned in the Siāhchāl "Black Pit", an underground dungeon in Tehran. Meanwhile echoes of the newspaper coverage of the violence continued into 1853. In most of his prominent writings, the Báb alluded to a Promised One, most commonly referred to as "He whom God shall make manifest", and that he himself was "but a ring upon the hand of Him Whom God shall make manifest." Within 20 years of the Báb's death, over 25 people claimed to be the Promised One, most significantly Bahá'u'lláh. Shortly before the Báb's execution, a follower of the Báb, Abd al-Karim, brought to the Báb's attention the necessity to appoint a successor; thus the Báb wrote a certain number of tablets which he gave to Abd al-Karim to deliver to Subh-i Azal and Bahá'u'lláh. These tablets were later interpreted by both Azalis and Bahá'ís as proof of the Báb's delegation of leadership. Some sources state that the Báb did this at the suggestion of Bahá'u'lláh. In one of the tablets, which is commonly referred to as the Will and Testament of the Báb, Subh-i Azal is viewed to have been appointed as leader of the Bábis after the death of the movement's founder; the tablet, in verse 27, orders Subh-i Azal "...to obey Him Whom God Shall Make Manifest." At the time of the apparent appointment Subh-i Azal was still a teenager, had never demonstrated leadership in the Bábí movement, and was still living in the house of his older brother, Bahá'u'lláh. All of this lends credence to the Bahá'í claim that the Báb appointed Subh-i Azal the head of the Bábí Faith so as to divert attention away from Bahá'u'lláh, while allowing Bábís to visit Bahá'u'lláh and consult with him freely, and allowing Bahá'u'lláh to write Bábís easily and freely. Subh-i Azal's leadership was controversial. He generally absented himself from the Bábí community spending his time in Baghdad in hiding and disguise; and even went so far as to publicly disavow allegiance to the Báb on several occasions. Subh-i Azal gradually alienated himself from a large proportion of the Bábís who started to give their alliance to other claimants. During the time that both Bahá'u'lláh and Subh-i-Azal were in Baghdad, since Subh-i Azal remained in hiding, Bahá'u'lláh performed much of the daily administration of the Bábí affairs. Bahá'u'lláh claimed that in 1853, while a prisoner in Tehran, he was visited by a "Maid of Heaven", which symbolically marked the beginning of his mission as a Messenger of God. Ten years later in Baghdad, he made his first public declaration to be He whom God shall make manifest to a small number of followers, and in 1866 he made the claim public. Bahá'u'lláh's claims threatened Subh-i Azal's position as leader of the religion since it would mean little to be leader of the Bábís if "Him Whom God Shall Make Manifest" were to appear and start a new religion. Subh-i-Azal responded by making his own claims, but his attempt to preserve the traditional Bábísm was largely unpopular, and his followers became the minority. Eventually Bahá'u'lláh was recognized by the vast majority of Bábís as "He whom God shall make manifest" and his followers began calling themselves Bahá'ís. By 1908, there were probably from half a million to a million Bahá'ís, and at most only a hundred followers of Subh-i Azal. 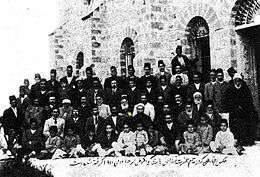 Subh-i Azal died in Famagusta, Cyprus in 1912, and his followers are known as Azalis or Azali Bábis. MacEoin notes that after the deaths of those Azali Babis who were active in the Persian Constitutional Revolution, the Azali form of Babism entered a stagnation from which it has not recovered as there is no acknowledged leader or central organization. Current estimates of Azalis are that there are no more than a few thousand. The World Religion Database estimated 7.3 million Bahá'ís in 2010 and stated: "The Baha'i Faith is the only religion to have grown faster in every United Nations region over the past 100 years than the general population; Baha'i(sic) was thus the fastest-growing religion between 1910 and 2010, growing at least twice as fast as the population of almost every UN region." Bahá'í sources since 1991 usually estimate the worldwide Bahá'í population at "above 5 million". See Bahá'í statistics. The Báb's major writings include the Qayyúmu'l-Asmá' (a commentary on the Sura of Joseph), and the Persian Bayán, which the Bábís saw as superseding the Qur'an. The latter has been translated into French; only portions exist in English. Unfortunately, most of the writings of the Báb have been lost. The Báb himself stated they exceeded five hundred thousand verses in length; the Qur'an, in contrast, is 6300 verses in length. If one assumes 25 verses per page, that would equal 20,000 pages of text. Nabíl-i-Zarandí, in The Dawn-breakers, mentions nine complete commentaries on the Qur'an, revealed during the Báb's imprisonment at Máh-Kú, which have been lost without a trace. Establishing the true text of the works that are still extant, as already noted, is not always easy, and some texts will require considerable work. Others, however, are in good shape; several of the Báb's major works are available in the handwriting of his trusted secretaries. Most works were revealed in response to specific questions by Bábís. This is not unusual; the genre of the letter has been a venerable medium for composing authoritative texts as far back as Paul of Tarsus. Three quarters of the chapters of the New Testament are letters, were composed to imitate letters, or contain letters within them. Sometimes the Báb revealed works very rapidly by chanting them in the presence of a secretary and witnesses. The Archives Department at the Bahá'í World Centre currently holds about 190 Tablets of the Báb. Excerpts from several principal works have been published in the only English language compilation of the Báb's writings: Selections from the Writings of the Báb. Denis MacEoin, in his Sources for Early Bābī Doctrine and History, gives a description of many works; much of the following summary is derived from that source. In addition to major works, the Báb revealed numerous letters to his wife and followers, many prayers for various purposes, numerous commentaries on verses or chapters of the Qur'an, and many khutbihs or sermons (most of which were never delivered). Many of these have been lost; others have survived in compilations. The Báb's teachings can be grouped into three broad stages which each have a dominant thematic focus. His earliest teachings are primarily defined by his interpretation of the Qur'an and other Islamic traditions. While this interpretive mode continues throughout all three stages of his teachings, a shift takes place where his emphasis moves to philosophical elucidation and finally to legislative pronouncements. In the second philosophical stage, the Báb gives an explanation of the metaphysics of being and creation, and in the third legislative stage his mystical and historical principles are explicitly united. An analysis of the Báb's writings throughout the three stages shows that all of his teachings were animated by a common principle that had multiple dimensions and forms. In Twelver Shi'a Islamic belief there were twelve Imams, the last of which, known as Imam Mahdi, who communicated with his followers only through certain representatives. According to the Twelver's belief, after the last of these representatives died, the Imam Mahdi went into a state of Occultation; while still alive, he was no longer accessible to his believers. Shi'a Muslims believe that when the world becomes oppressed, the Imam Mahdi (also termed the Qa'im) will come out of occultation and restore true religion on Earth before the cataclysmic end of the world and judgement day. In Bábí belief the Báb is the return of the Imam Mahdi, but the doctrine of the Occultation is implicitly denied; instead the Báb stated that his manifestation was a symbolic return of the Imam, and not the physical reappearance of the Imam Mahdi who had died a thousand years earlier. In Bábí belief the statements made from previous revelations regarding the Imam Mahdi were set forth in symbols. The Báb also stated that he was not only the fulfillment of the Shi`i expectations for the Qá'im, but that he also was the beginning of a new prophetic dispensation. The Báb taught that his revelation was beginning an apocalyptic process that was bringing the Islamic dispensation to its cyclical end, and starting a new dispensation. He taught that the terms "resurrection", "Judgement Day", "paradise" and "hell" used in Shi'a prophecies for the end-times are symbolic. He stated that "Resurrection" means that the appearance of a new revelation, and that "raising of the dead" means the spiritual awakening of those who have stepped away from true religion. He further stated that "Judgement Day" refers to when a new Manifestation of God comes, and the acceptance or rejection of those on the Earth. Thus the Báb taught that with his revelation the end times ended and the age of resurrection had started, and that the end-times were symbolic as the end of the past prophetic cycle. In the Persian Bayán, the Báb wrote that religious dispensations come in cycles, as the seasons, to renew "pure religion" for humanity. This notion of continuity anticipated future prophetic revelations after the Báb. While the Báb claimed a station of revelation, he also claimed no finality for his revelation. One of the core Bábí teachings is the great Promised One, whom the Báb termed He whom God shall make manifest, promised in the sacred writings of previous religions would soon establish the Kingdom of God on the Earth. In the books written by the Báb he constantly entreats his believers to follow He whom God shall make manifest when he arrives and not behave like the Muslims who have not accepted his own revelation. The Báb abrogated Islamic law and in the Persian Bayán promulgated a system of Bábí law, thus establishing a separate religion distinct from Islam. Some of the new laws included changing the direction of the Qibla to the Báb's house in Shiraz, Iran and changing the calendar to a solar calendar of nineteen months and nineteen days (which became the basis of the Bahá'í calendar) and prescribing the last month as a month of fasting. The Báb also created a large number of rituals and rites which remained largely unpracticed. Some of these rituals include the carrying of arms only in times of necessity, the obligatory sitting on chairs, the advocating of the cleanliness displayed by Christians, the non-cruel treatment of animals, the prohibition of beating children severely, the recommendation of the printing of books, even scripture and the prohibition on the study of logic or dead languages. While some statements in the Bayan show tolerance, there are other very harsh regulations in regards to relations with non-believers. For example, non-believers are forbidden to live in five central Iranian provinces, the holy places of previous religions are to be demolished, all non-Bábí books should be destroyed, believers are not to marry or sit in the company of non-believers, and the property of non-believers can be taken from them. Some further ritual include elaborate regulations regarding pilgrimage, fasting, the manufacture of rings, the use of perfume, and the washing and disposal of the dead. Denis MacEoin writes, regarding the Bayán: "One comes away from the Bayan with a strong sense that very little of this is to be taken seriously. It is a form of game, never actually intended to be put into practice." Instead he states that "the Bábí shari'a made an impact... it stated very clearly that the Islamic code could be replaced." Nader Saiedi states that the severe laws of the Bayán were never meant to be put in practice, because their implementation depended on the appearance of He whom God shall make manifest, while at the same time all of the laws would be abrogated unless the Promised One would reaffirm them. Saiedi concludes that these can then only have a strategic and symbolic meaning, and were meant to break through traditions and to focus the Báb’s followers on obedience to He whom God shall make manifest. 1 2 Saiedi, Nader (2008). Gate of the Heart. Waterloo, ON: Wilfrid Laurier University Press. p. 19. ISBN 978-1-55458-035-4. 1 2 3 MacEoin, Dennis (2011). "Babism". Encyclopædia Iranica. ↑ Smith, Peter (2000). "Shi'ism". A concise encyclopedia of the Bahá'í Faith. Oxford: Oneworld Publications. pp. 312–313. ISBN 1-85168-184-1. 1 2 Saiedi, Nader (2008). Gate of the Heart. Waterloo, ON: Wilfrid Laurier University Press. p. 15. ISBN 978-1-55458-035-4. 1 2 3 4 5 6 Bausani, A. (1999). "Bāb". Encyclopedia of Islam. Leiden, The Netherlands: Koninklijke Brill NV. ↑ Mehrabkhani, R. (1987). Mullá Ḥusayn: Disciple at Dawn. Los Angeles, CA, USA: Kalimat Press. pp. 58–73. ISBN 0-933770-37-5. 1 2 3 4 5 6 MacEoin, Dennis (1989). "Bāb, Sayyed `Ali Mohammad Sirazi". Encyclopædia Iranica. ↑ "The Time of the Báb". BBC. Retrieved 2 July 2006. ↑ Amanat, Resurrection and Renewal, 191. ↑ Saiedi, Nader (2008). Gate of the Heart. Waterloo, ON: Wilfrid Laurier University Press. p. 19. ISBN 978-1-55458-035-4. ↑ Amanat, Resurrection and Renewal, 171. 1 2 Amanat, Resurrection and Renewal, 230-31. 1 2 3 Moojan Momen (1981) . The Bábí and Bahá'í religions 1844-1944: some contemporary western accounts. G. Ronald. pp. xv, xvi, 4, 11, 26–38, 62–5, 83–90, 100–104. ISBN 978-0-85398-102-2. 1 2 3 "MacEoin, Denis M". ENCYCLOPÆDIA IRANICA. Online. 15 December 1988. Retrieved 8 November 2013. ↑ National Spiritual Assembly of the Bahá'ís of the United States (1977). World order. National Spiritual Assembly of the Baha'is of the United States. Retrieved 20 August 2013. ↑ Amanat, Resurrection and Renewal, 257. ↑ Cheyne, The Reconciliation of Races and Religions, 29. ↑ Amanat, Resurrection and Renewal, 258. 1 2 3 4 Smith, Peter (2000). "Báb". A concise encyclopedia of the Bahá'í Faith. Oxford: Oneworld Publications. pp. 55–59. ISBN 1-85168-184-1. ↑ Smith, Peter (Spring–Summer 1984). "Research Note; A note on Babi and Baha'i Numbers in Iran". Iranian Studies. International Society for Iranian Studies. 17 (2–03): 295–301. doi:10.1080/00210868408701633. JSTOR 4310446. ↑ "Early mention of Bábís in western newspapers, summer 1850". Historical documents and Newspaper articles. Bahá'í Library Online. 2010-09-17 [Autumn 1850]. Retrieved August 20, 2013. 1 2 MacEoin, Denis (1983). "From Babism to Baha'ism: Problems of Militancy, Quietism, and Conflation in the Construction of a Religion". Religion. 13 (1983): 219–55. doi:10.1016/0048-721X(83)90022-2. 1 2 MacEoin, Denis (1983). "A Note on the Numbers of Babi and Baha'i Martyrs". Baha'i Studies Bulletin. 02 (3–1983): 68–72. 1 2 MacEoin, Denis (1983). "A Note on the Numbers of Babi and Baha'i Martyrs in Iran". Baha'i Studies Bulletin. 02 (2–1983): 84–88. 1 2 Smith, Peter (2000). "Tabarsi, Shaykh". A concise encyclopedia of the Bahá'í Faith. Oxford: Oneworld Publications. p. 331. ISBN 1-85168-184-1. 1 2 3 4 Smith, Peter (2000). "Zanjan". A concise encyclopedia of the Bahá'í Faith. Oxford: Oneworld Publications. pp. 368–369. ISBN 1-85168-184-1. 1 2 3 Smith, Peter (2000). "Nayriz". A concise encyclopedia of the Bahá'í Faith. Oxford: Oneworld Publications. p. 260. ISBN 1-85168-184-1. ↑ Shoghi, Effendi (1944). God Passes By. Wilmette, Illinois, USA: Bahá'í Publishing Trust. pp. 273–289. ISBN 0-87743-020-9. ↑ A History of Persia from the Beginning of the Nineteenth Century to the Year 1858 by Robert Grant Watson, 1866. ↑ Momen, Moojan (August 2008). "Millennialism and Violence: The Attempted Assassination of Nasir al-Din Shah of Iran by the Babis in 1852". Nova Religio: The Journal of Alternative and Emergent Religions. 12 (1): 57–82. doi:10.1525/nr.2008.12.1.57. JSTOR 10.1525/nr.2008.12.1.57. ↑ "POLAK, Jakob Eduard". ENCYCLOPÆDIA IRANICA. Online. December 15, 2009. Retrieved 2010-07-07. ↑ Polak, Jakob Eduard (1865). "Martyrdom of Tahirih (Dr Jakob Eduard Polak)". Persien. F.A. Brockhaus. p. 350. 1 2 Hutter, Manfred (2005). "Bahā'īs". In Ed. Lindsay Jones. Encyclopedia of Religion. 2 (2nd ed.). Detroit: Macmillan Reference USA. pp. 737–740. ISBN 0-02-865733-0. 1 2 Amanat, Abbas (1989). Resurrection and Renewal: The Making of the Babi Movement in Iran. Ithaca: Cornell University Press. p. 384. ↑ `Abdu'l-Bahá (2004) . Browne, E.G. (Tr. ), ed. A Traveller's Narrative: Written to illustrate the episode of the Bab (2004 reprint, with translator's notes ed.). Los Angeles, USA: Kalimát Press. p. 37. ISBN 1-890688-37-1. ↑ Taherzadeh, Adib (1976). The Revelation of Bahá'u'lláh, Volume 1. Oxford, UK: George Ronald. p. 37. ISBN 0-85398-270-8. ↑ Manuchehri, S. (2004). "The Primal Point's Will and Testament". Research Notes in Shaykhi, Babi and Baha'i Studies. 7 (2). 1 2 3 4 Cole, Juan. "A Brief Biography of Baha'u'llah". Retrieved 22 June 2006. 1 2 3 4 5 MacEoin, Dennis (1989). "Azali Babism". Encyclopædia Iranica. 1 2 Barrett, David (2001). The New Believers. London, UK: Cassell & Co. p. 246. ISBN 0-304-35592-5. ↑ Johnson 2013, pp. 59-62. ↑ MacEoin, Sources for Early Bābī Doctrine and History, 15. ↑ Denis MacEoin, The Sources for Early Bābī Doctrine and History (Leiden: Brill, 1992), 88. ↑ MacEoin, Sources for Early Bābī Doctrine and History, 12-15. ↑ On letters as a medium of composition of the New Testament, see Norman Perrin, The New Testament: An Introduction, Proclamation and Parenesis, Myth and History (New York: Harcourt Brace Jovanovitch, 1974), 96-97. ↑ Unpublished letter from the Universal House of Justice. "Numbers and Classifications of Sacred Writings Texts". Retrieved 16 December 2006. ↑ MacEoin, Sources for Early Bābī Doctrine and History, 15-40. ↑ Saiedi, Nader (2008). Gate of the Heart. Waterloo, ON: Wilfrid Laurier University Press. pp. 27–28. ISBN 978-1-55458-035-4. ↑ Saiedi, Nader (2008). Gate of the Heart. Waterloo, ON: Wilfrid Laurier University Press. p. 49. ISBN 978-1-55458-035-4. 1 2 3 4 5 6 7 Browne, Edward G. (1889). Bábism. 1 2 3 4 5 6 Amanat, Abbas (2000). Stephen J. Stein, ed., ed. "The Resurgence of Apocalyptic in Modern Islam". The Encyclopedia of Apocalypticism. New York: Continuum. III: 230–254. 1 2 3 Esslemont, J.E. (1980). Bahá'u'lláh and the New Era (5th ed.). Wilmette, Illinois, USA: Bahá'í Publishing Trust. ISBN 0-87743-160-4. ↑ Farah, Caesar E. (1970). Islam: Beliefs and Observances. Woodbury, NY: Barron's Educational Series. ↑ Hutter, Manfred (2005). "Babis". In Lindsay Jones. Encyclopedia of Religion. Vol. 2 (2nd ed.). Detroit: Macmillan Reference USA. pp. 727–729. ↑ Walbridge, John (2002). "Chap. 3". Essays and Notes on Bábí and Bahá'í History. East Lansing, Michigan: H-Bahai Digital Library. 1 2 3 4 5 6 MacEoin, Denis (23 March 2006). "Deconstructing and Reconstructing the Shari'a: the Bábí and Bahá'í Solutions to the Problem of Immutability". bahai-library.org. Retrieved 11 July 2006. "Bábi", Encyclopædia Britannica, 9th ed., Vol. III, New York: Charles Scribner's Sons, 1878, p. 180 . "Bâbi", Encyclopædia Britannica, American Rev., Vol. III, Chicago: Werner Co., 1893, pp. 180–181 . "Bábíism", Encyclopædia Britannica, 11th ed., Vol. III, Cambridge: Cambridge University Press, 1911, pp. 94–95 . Amanat, Abbas (1989). Resurrection and Renewal: The Making of the Bábí Movement in Iran 1844–1850. Ithaca, NY: Cornell University Press. ISBN 0-8014-2098-9. Cheyne, Thomas Kelly (2007). The Reconciliation of Races and Religions. Echo Library. ISBN 1406845469. Esslemont, J. E. (1980). Bahá'u'lláh and the New Era, An Introduction to the Bahá'í Faith (5th ed.). Wilmette, Illinois: Bahá'í Publishing Trust. ISBN 0-87743-160-4. MacEoin, Denis (1994). Rituals in Babism and Baha'ism. Cambridge, UK: British Academic Press and Centre of Middle Eastern Studies, University of Cambridge. ISBN 1-85043-654-1. Johnson, Todd M.; Brian J. Grim (2013). "Global Religious Populations, 1910–2010". The World's Religions in Figures: An Introduction to International Religious Demography. John Wiley & Sons. pp. 59–62. doi:10.1002/9781118555767.ch1. ISBN 9781118555767. MacEoin, Denis (1992). The Sources for Early Bābī Doctrine and History: A Survey. Leiden, The Netherlands: Brill. ISBN 90-04-09462-8. Nabíl-i-Zarandí (1932). The Dawn-Breakers: Nabíl’s Narrative. trans. Shoghi Effendi. Wilmette, Illinois: Bahá'í Publishing Trust. ISBN 0-900125-22-5. Saiedi, Nader (2008). Gate of the Heart: Understanding the Writings of the Báb. Canada: Wilfrid Laurier University Press. ISBN 978-1-55458-056-9. Smith, Peter (1987). The Bábí and Bahá'í Religions: From Messianic Shi'ism to a World Religion. Cambridge, UK: Cambridge University Press. ISBN 0-521-30128-9. Wikisource has the text of the 1905 New International Encyclopedia article Babism. Afnan, Habibuʾllah (2008). Ahang Rabbani, ed. The Genesis of the Bábí-Bahá'í Faiths in Shíráz and Fárs. Numen Book Series - Studies in the History of Religions -Texts and Sources in the History of Religions. 122. Boston, USA: Brill; Leiden. ISBN 978-90-04-17054 4. ISSN 0169-8834. MacEoin, Denis (2009). The Messiah of Shiraz: Studies in Early and Middle Babism. Leiden, The Netherlands: Brill. ISBN 90-04-17035-9.